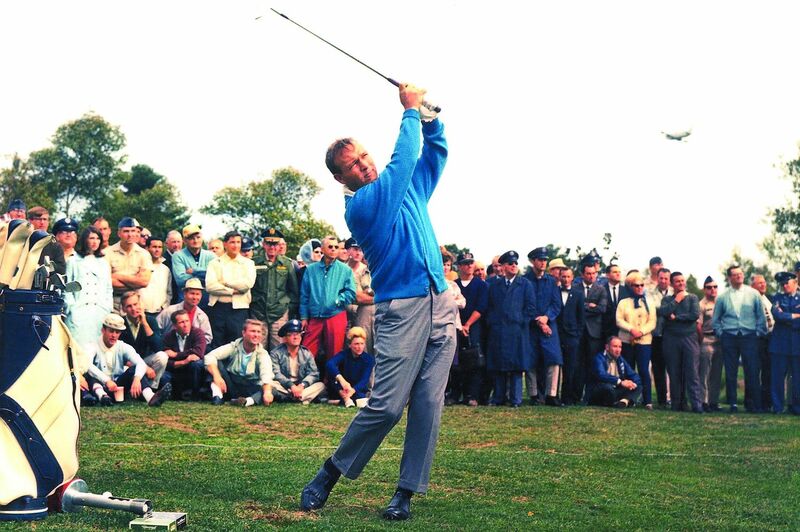 EVEN AS HE BECAME ONE OF THE TOP GOLFERS AND WORLD FAMOUS, ARNOLD PALMER (’51, LL.D. ’70) NEVER FORGOT WAKE FOREST. When he died September 25, 2016, at the age of 87, Palmer was remembered as one of golf’s greatest players, of course, but as an even better human being. He transcended the sport to become an American icon. He played golf with presidents, from Eisenhower to Bill Clinton, and celebrities, from Bob Hope to Vince Gill. 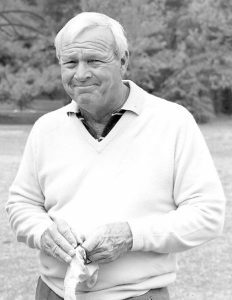 But it was his gracious personality and common touch that endeared him to the throngs of fans in Arnie’s Army who continued to cheer him on long after his PGA days were behind him. “Here’s to The King who was as extraordinary on the links as he was generous to others,” tweeted then-President Barack Obama. 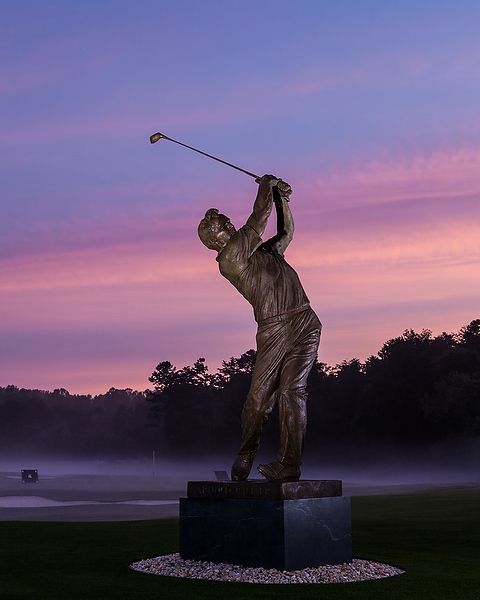 Wake Forest students paid tribute to his legacy by leaving flowers, golf balls and a can of iced tea beside the statue of Palmer swinging his golf club at the Haddock House Golf Center on campus. The men’s golf team toasted him with glasses of “Arnold Palmers,” his signature drink of sweet tea and lemonade. All athletic teams wore a patch with “AP” on their jerseys, and athletic fields and other venues sported Palmer’s distinctive multicolor umbrella logo. At the Wake Forest-Syracuse football game two weeks after his death, a video tribute played on the Jumbotron. 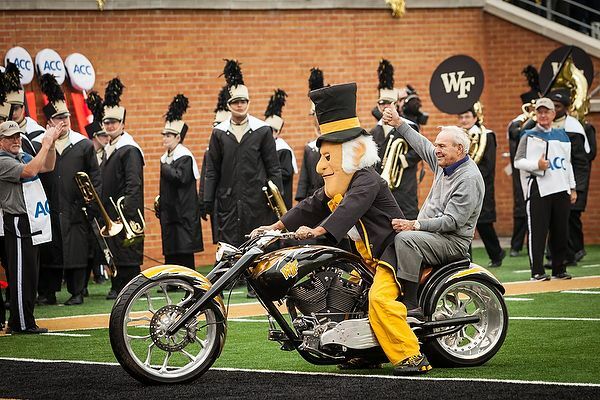 Then the Demon Deacon mascot, as is tradition, opened the gate. He rode a motorcycle onto BB&T Field, this time with no passenger behind him. In 2009 and 2013 Palmer had been that passenger. 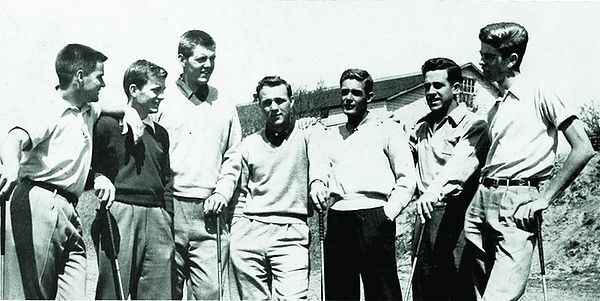 Led by Palmer (center) and Worsham (far left), Wake Forest won the 1950 Southern Conference Championship, played at Old Town Club in Winston-Salem. Palmer lived in the rundown Colonial Club boarding house with other athletes, but he spent most of his time on the Donald Ross-designed Paschal Golf Course. Professor A.C. Reid (1917, MA 1918, P ’48) once stopped Palmer, who was carrying his golf bag, and asked, “Mister Palmer, do you really think you can make a living playing with those sticks on your back?” Professor James “Pop” Carroll (1908) was known to tell Palmer, “Hit ’em good today, Arnie!” when Palmer would invariably slip out of his astronomy class early to head to the course. 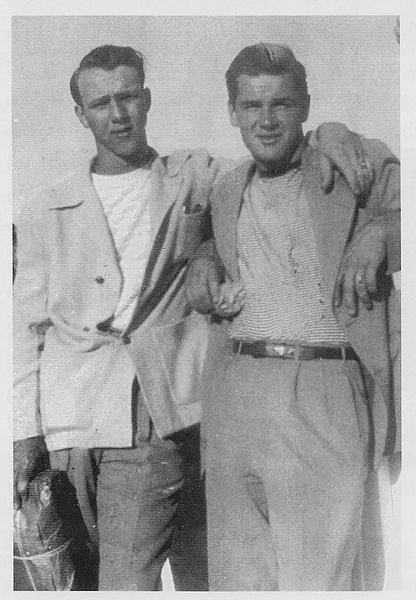 Arnold Palmer hadn’t given much thought to attending college until his best friend, Buddy Worsham, received a scholarship to Wake Forest. Worsham’s death in 1950 devastated Palmer. Palmer’s world collapsed when, in 1950, Worsham died in a car accident on his way back to campus from a Homecoming dance in Durham. He was Palmer’s best friend and roommate. Palmer had turned down his offer that night to travel to the dance. He went to a movie instead. He went on to win the U.S. Amateur in 1954 and then turned pro. 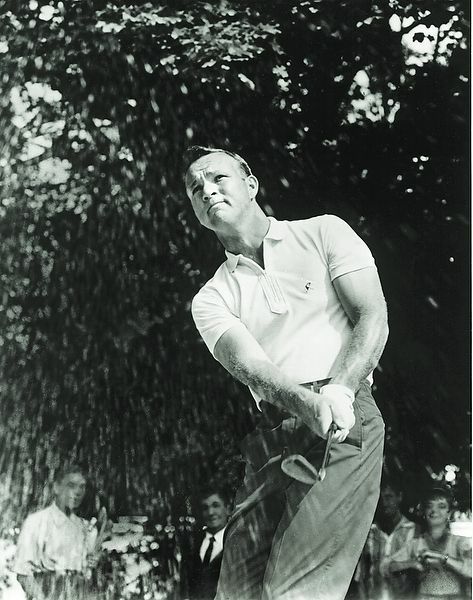 In his career, he won 62 PGA tournaments including four Masters, two British Opens and one U.S. Open. 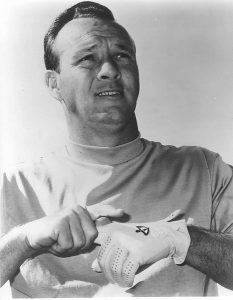 As a Coast Guard yeoman in New Jersey and Ohio, Palmer continued to hone his golf game and built a nine-hole course at his base in Cape May, New Jersey. 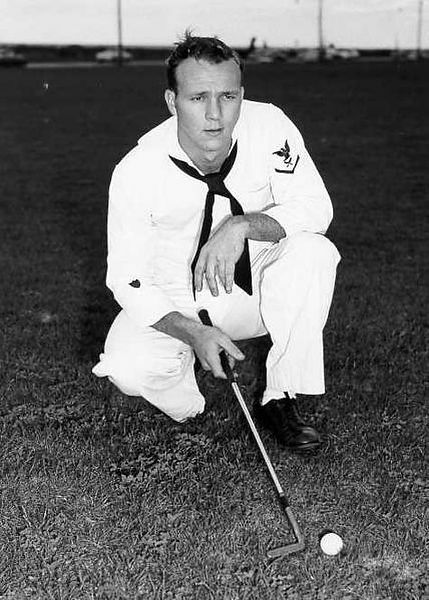 His commanding officer wanted him to pursue a career in the Coast Guard; Palmer was set on becoming a professional golfer. Palmer was also well known for his charity work. 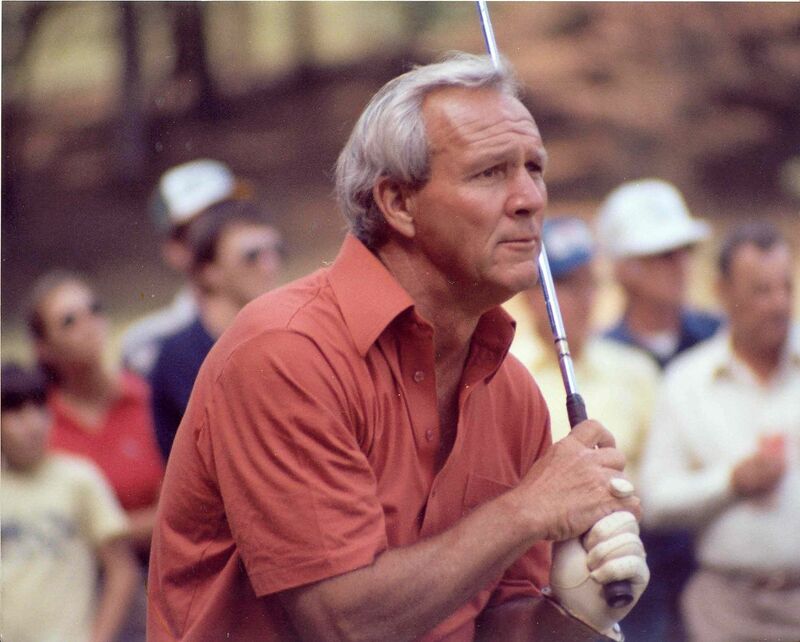 After touring a children’s hospital in Orlando, Florida, in the 1980s, he said, “We can do better than this and we should do better than this for our children.” He soon helped found the Arnold Palmer Hospital for Children. Following the death of his first wife, Winnie, from cancer, he founded the Winnie Palmer Hospital for Women and Babies in Orlando. Cancer centers in Latrobe and Rancho Mirage, California, also bear his name. 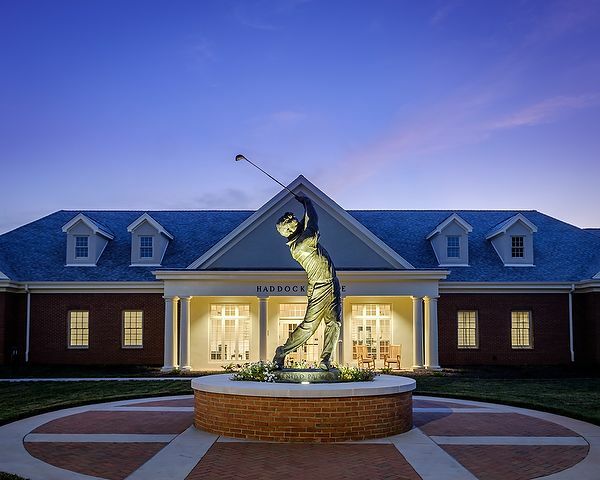 He always found time for Wake Forest, serving as a University trustee, founding the President’s Club and the Arnie’s Army giving clubs in the 1970s and helping lead the Heritage and Promise capital campaign in the 1990s. He established a golf scholarship in the 1960s in memory of Worsham. A residence hall and the golf practice complex are named in his honor. Two weeks before his death, he welcomed a group of trustees to Latrobe. “I have traveled around the world, and I can tell you there is truly no place like home, and no place like Wake Forest,” Palmer once said. 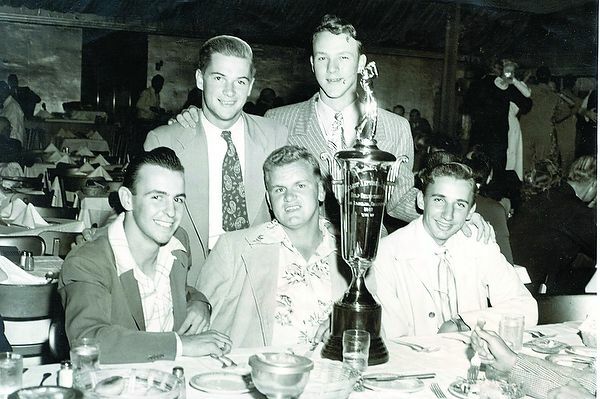 Best friends Buddy Worsham and Arnold Palmer (back row) at the 1947 Hearst National Junior Championship in California. Neither won the tournament, but it was a pivotal event in Palmer’s life. “The whole way west to California on the train, Bud talked up a storm about where he was going to college. Some place down south called Wake Forest,” Palmer wrote in his autobiography. Some of the nation’s top professional golfers got their start at Wake Forest through the Buddy Worsham or Arnold Palmer Scholarships. Journalist Albert R. Hunt ('65, Lit.D. '91, P '11) paid tribute to Arnold Palmer in the following column that appeared in the Pittsburgh Post-Gazette on Sept. 26, 2016. Arnold Palmer was the most celebrated and one of the most devoted sons of Wake Forest, which he attended for one reason — to play golf — almost 70 years ago. The Latrobe native, who passed away at age 87, never graduated and liked to joke about his lack of academic proficiency. But no scholar contributed more. Donors often are torn between what they see as a reasonable contribution and the institution’s request for a higher number. Former university president Tom Hearn told me every time that would-be contributor was a golfer and he asked Arnie to play a round with them, they gave the higher amount. And even with his packed schedule he rarely said no. No one raised more money or brought more charm and charisma to the little school where he arrived, with one suitcase and golf clubs, in 1947, a late entry to join his golfing pal, Buddy Worsham. After three years when Worsham was tragically killed in an automobile accident Palmer left to join the Coast Guard after which he returned for a year. He led the Deacons to the first ACC golf championship and started a national dynasty in the sport. He spent more time on the links than in the classroom and once while he was walking past the law library, golf bag in tow, a student remarked: “He’ll never make a living playing golf.” It wasn’t too many years later that that same man picked up Palmer at the Raleigh-Durham airport for a charity event. Arnie arrived in his private plane. He never lost touch with his alma mater, endowing the first golf scholarship in memory of Worsham, heading the University’s fundraising drive, serving on the board of trustees and often returning to regale admirers. 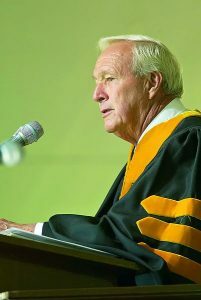 In 2005 — almost a half-century after the school had moved from the tiny town of Wake Forest to Winston-Salem — he gave the commencement address. Like Arnie’s Armies in the galleries, he had them in his hand. Wake Forest, not renowned for its football prowess, had an unusually strong season and played Louisville in the 2007 Orange Bowl. Both teams picked honorary captains to face off before the game. Louisville chose Muhammad Ali; Wake chose Arnie. What a magical pair. 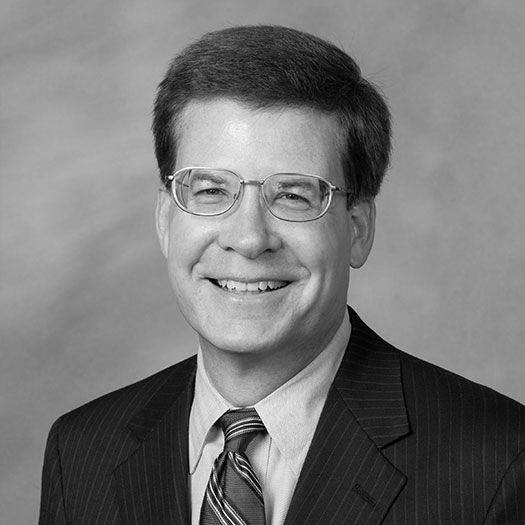 Hunt is a former trustee, a member of the Wake Forest University Writers Hall of Fame, a Bloomberg View columnist and a regular contributor on Bloomberg Television. This column is reprinted with permission. BELOW, AS THEY APPEARED, ARE EXCERPTS OF REMEMBRANCES FROM EMAILS, TWEETS, FACEBOOK POSTS AND THE ONLINE GUESTBOOK (ARNOLDPALMER.WFU.EDU).